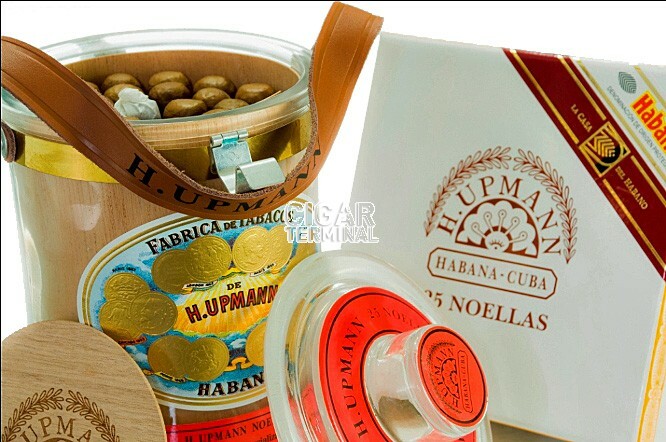 The H.Upmann Noellas is an accessible handmade cigar of Cosaco format Habano, 42 ring gauge, 5.3” (135mm) long and comes in a glass jar of 25 cigars. • Standard production cigar until it was discontinued in the early 80s, then re-instated in the early 2000s. The cigar looks good; the wrapper has a beautiful dark brown color (Colorado maduro). 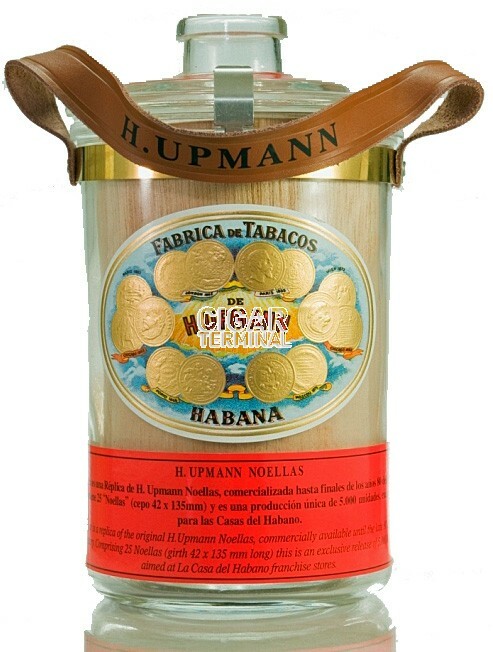 The H.Upmann Noellas sports a second band the official La Casa del Habano. The triple cap looks amazing; the foot looks well packed while the whole cigar feels firm when squeezed. It is also pretty smooth and has virtually no veins. The aroma at cold is mainly of barnyard, with some sweet notes of milk chocolate and caramel. The cold draw is rather tight, but nothing to worry about and gives some flavors of cream, leather, chocolate and some sweet touch of nougat. Upon lighting up the cigar, a blast of flavors reaches the palate. Among them, mostly cedar, coffee and some acidity. After a punchy start, the cigar calms down and settles at a mild to medium body for the whole first third. Once the initial blast passed, the flavors are more distinguishable, there is good amount of wood, earth and some enjoyable chocolate notes as well as some bitter notes from leather. There are also some faint notes of spices from time to time. It is very pleasant overall, the flavors mix well together. The smoke created by the Noellas is satisfactory, and pretty dry in taste, almost reminiscent of a dry pasta smell. The ashes’ color is of gray-whitish color and the ashes are holding on nicely for the whole first third. The after taste is pretty short and dry, but has a nice taste. The Noellas is not overpowering whatsoever at this point. In the second third, the draw starts opening up a bit, making the smoking more satisfying. The cigar strength has picked up a bit, and the Noellas is now a medium bodied cigar. 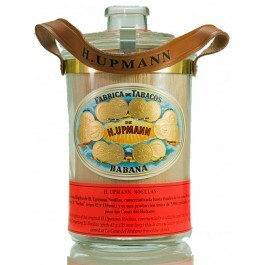 There is also more complexity in the flavor mix, which is more how a H.Upmann tastes like. In addition to the flavors from the first third, there is now some sweetness, some mix of roasted nuts or almonds, with some vanilla, almost tasting like a vanilla ice cream. The spice notes recede to the background, making the whole flavor mix much rounder, especially the retrohale. The final third is really where the Noellas reveals its true potential, the draw is now as good as it gets. The flavor profile has evolved again, the cedar receded almost fully, leaving ample room for chocolate, earth, leather and roasted nuts flavors. The vanilla sweetness is also gone; there is now some notes of caramel instead. The cigar is delightful in the final third, and so is the retrohale, all flavor and smooth. A great little cigar that deserves to be tried by every Cuban cigar aficionado. It should be aged for at least 2 years, and a bit longer if kept in its jar as the aging process is slower with less airflow, but which gives some great flavors in return.